Today is a pretty exciting day because it is the last month of blocks for the Bella Skill Builder!!!! That means a finished quilt is practically right around the corner!!! So exciting ;) I can't wait to see this awesome quilt along hosted by the Fat Quarter Shop and Sherri McConnell!!!! And this month's skill builder blocks are all about the Lazy Angle!!! This was my first time trying these kind of blocks out and they really are a lot of fun!!! For this month's tone on tone blocks, I found myself again picking colors that had me craving for fruit ;) Gotta love those descriptive names that perfectly match the colors and maybe make you drool for reals :) For the small version of the block I used Bella Kiwi and Lime. And for the large version of the block I used Bella Betty Orange and Ochre. So I ended up with some of the piecing not really showing up because of the color, and of course, I forgot that I was making 12" blocks and made mine the 10" block size recommended so had to add a little border on it. But all in all, I think it is still pretty fun. And that is the Lazy Angle block, the last set of blocks in the Bella Skill Builder!!!! Be sure to download the free pattern and watch youtube video. 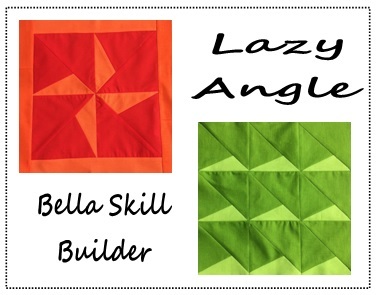 And also pop on over to the Fat Quarter Shop's blog, Jolly Jabber for lots more Lazy Angle Block details and wonderful Block eye candy from lots more blogger friends ;) I hope you are enjoying the Bella Skill Builder fun as much as I am!! !